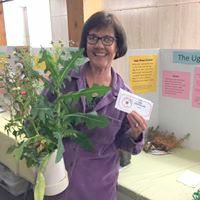 The Julian Wildflower Show will be open from 10:00 am to 4:00 pm, from May 3 to May 5, 2019. It is held in the Julian Town Hall, lower level, at Highway 78/79 and Main Street. The show is free to the public.The Julian Wildflower Show has been an historical event for over 91 years. Because of Julian’s mountain valley location, bordering a national forest and close to the Anza-Borrego State Park, we have 855 species of plants within 25 miles of town, many of which were used for health and healing by Native Americans. The Show is meant to educate club members, local residents, out-of-town visitors and children about the botanical wealth of Julian and its vicinity. With permission from landowners, club members spend two days gathering wildflowers from five plant zones. The wildflowers are displayed in the Julian Town Hall for three days. The flowers are arranged on tables representing the different geographical areas and plant zones in which they are picked. Display cards provided the name of the plant and described uses of the various plants by Native Americans.